5. Ellisville to Gray Summit. The Pony Bridge over the South Canadian River. Ft. Reno to Weatherford is the best ride in the four most eastern Route 66 states. There are two alignments, neither of which is well marked, but both of which are part of one of the longest and best preserved remaining sections of Route 66. The roadway consists of a skinny ribbon that passes almost entirely through prosperous farm communities made all the more prosperous from the abundance of oil wells. The 1926 alignment makes a 20 mile loop through Calumet and Geary. The newer alignment cuts off that loop and meets the 1926 route near the largest of the "Pony Bridges" on Route 66. These bridges got their name because their spans conjure images of galloping ponies. The remaining 25 miles to Weatherford pass through rural neighborhoods far out of sight of I-40, and pass by Lucille's, which was a service station and roadhouse that Lucille Hamon operated for 59 years. This is not a flashy portion of Route 66. There are no colorful neon signs, odd roadside attractions or bustling communities offering food and lodging. But of all the Route 66 rides, this one most makes me imagine the Oakies and others traveling west on Route 66 in search of better lives. I wish there was more to say about this ride. Although there are some interesting things to see, like the replica of the Hubble Telescope in Marshfield, there are no real "classic Route 66" points of interest. Nonetheless, it's enough fun for me to name it as my fourth favorite ride on Route 66. The Munger Moss Motel is at the eastern end of Lebanon. The ride from the western edge of town to just outside of Springfield is one of the prettiest on Route 66. It hugs closely to I-44, but it veers inland enough to give the feel of being in a rural area. It is perfect terrain for a motorcycle. There are prosperous farms, rolling hills, easy turns and lots of ponds. The "Summerville Fresh" in Conway has a great deli. There is a store between Conway and Marshfield that once was a notable Route 66 stopping point called Luthy's Buzz Inn, which was closed for several years. It reopened a year or so ago as Sorrell's Trading Post, which sold liquor, beer and rudimentary groceries. On my last pass through there it once again was closed. The 165 mile ride from the Crookton Road exit off of I-40 (near Ash Fork) to Topock is the longest remaining contiguous section of Route 66. The first half of that ride strays far from I-40 and passes through half a dozen towns before ending in Kingman. The roadway is in great condition and speeds of 65 mph are easily maintained. After getting off of I-40, Route 66 immediately descends into a wide valley filled with grasslands and cedar trees. There are replicas of Burma Shave signs on the way to Seligman. "The one who drives when-He's been drinking-Depends on you-To do his thinking-Burma Shave." The Snowcap Drive-In in Seligman may be the most photographed drive-in restaurant on Route 66. It has been known for decades as a place where the owners play practical jokes on their customers. It's an authentic Route 66 experience. The Rusty Bolt has three touristy stores. There are a couple of motels nearby, as is the "World Famous" Black Cat Bar. The Road Kill CafÃ© is a pretty famous spot, but the locals say Lilo's across the street is the best place in town to eat. From Seligman, Route 66 passes through Peach Springs, Truxton, and Valentine before reaching the Hackberry Store, which is the coolest spot along this portion of Route 66. There is a 1957 Corvette out front along with other antiques and Route 66 artifacts. It's a 25 mile ride from the Hackberry Store into Kingman. On the way the Kozy Corner Trailer Park has a huge totem called Giganticus Headicus. The Outpost Saloon also is on the way. Kingman has lots of Route 66 history, but the ride there, and as will be seen, the ride out are the real treats. Like many of my favorite Route 66 rides, there are not that many "things" to see between Mesita and Continental Divide. This is a ride worth taking just because of its beauty. There are two alignments of Route 66 from Albuquerque to Mesita and both require a stint on I-40. But once arriving in Mesita it is a 75 mile ride on the original 1926 alignment through a series of ghost towns and near ghost towns to Continental Divide. The seven mile ride from Mesita to Laguna twists well off of I-40 around "Dead Man's Curve" and passes by the grand red rock formations that dominate the skyline. "Owl Rock" is easily identifiable. Laguna was founded in 1699, which remarkably makes it the newest of the New Mexican pueblos. The St. Joseph of the Lake Mission Church has been restored, but still has its original adobe floor, beam ceiling and other vintage features. From Laguna, Route 66 passes through the pueblo villages of New Laguna and Paraje, through Budville (where Bud is available) and then on to the Villa de Cubero Trading Post, where Hemmingway supposedly wrote a portion of The Old Man and the Sea. Grants is the largest town between Albuquerque and Gallup. There are many vintage motels. They all in a state of severe disrepair; however, many of them still have their colorful neon signs. Pat's Lounge on the western edge of town is on my Top 10 Route 66 Bars list. After Grants, Route 66 passes through Milan, where the Wow Diner promises to Wow You with its unique atmosphere and atypical diner fare; Bluewater, which gets its name from nearby Bluewater Lake; Prewett, which has a place simply called "BAR"; and Thoreau, which may or may not have been named for Henry David depending on who is telling the story. The old road ends in Continental Divide, where there are a couple of Indian trading posts and the relics of a Whiting Bros. sign. The Cool Springs Store on the Oatman Highway. In a car, my top Route 66 ride would be the 165 miles from Crookton Rd. off of I-40 through Kingman and on to Topock. But on a motorcycle, the ride from I-40 to Kingman is distinct from the ride from Kingman over the Oatman Highway to Topock. I recently was in California interviewing a Canadian guy who had just finished riding the whole length of Route 66. When I asked him to tell me about his favorite part of his ride, he barely paused before saying it was the Oatman Highway. He said "You have to know what you're doing up there," and he is right. The Oatman Highway begins just west of Kingman and goes over Siltgreaves Pass through a series of mining towns before ending 65 miles away in Topock. 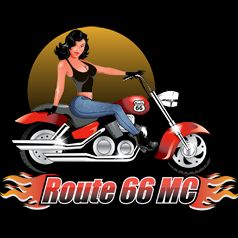 It is the only segment of Route 66 that is dangerous on a motorcycle, and that's what makes it so much fun. The roadway is narrow and there are steep drop offs, in many cases without guardrails. There are hair pin turns on steep grades, and where the speed limit signs say 15 mph they mean it. If you take a turn too wide, you risk hitting oncoming traffic. If you take one too tight, you risk tumbling off the road. The last time I was up there, I saw a car that had missed a turn and was lodged in a pile of rocks halfway down an embankment. Ed's Camp was another 1920's settlement, but it was built to serve local miners. Ed had a cafÃ©, a gas station, some campgrounds and a transplanted Saguaro cactus. Oatman is the mining town to which Clark Gable and Carol Lombard eloped. It is on my list of Top 10 Route 66 Towns, but the Oatman Highway would be my favorite Route 66 ride even if the town of Oatman was not there. So, there are my top 10 Route 66 rides. I hope they inspire you to get some kicks on Route 66 by finding your own favorites.